The first hands-on footage of the (PRODUCT)RED Special Edition iPhone 8 Plus has emerged, with YouTube video creator Marques Brownlee granted early access days to the charity-focused smartphone before orders are set to arrive with customers. Published on Tuesday, the four-minute video takes viewers through the iPhone's unboxing, highlighting the few differences between the (PRODUCT)RED and standard editions. Aside from the cover image showing the red-covered iPhone, the iPhone brand text on the sides are colored similarly, and while the items inside are the same as the other color options, there is an added card advising of (RED)'s charitable work. The iPhone 8 Plus is "really, really red," Brownlee admits, noting it to be a different shade from the anodized matte red iPhone 7. Brownlee suggests the addition of glass makes the iPhone 8 version appear like a "Ferrari red or ruby, or candy red." A big change from last year is the use of black bezels on the front, instead of last year's white. 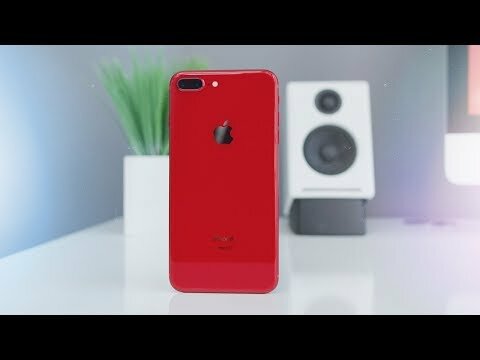 Brownlee's video for the PRODUCT(RED) iPhone 7 last year complained about the white bezel usage, and joked that Apple's usage of red and black for this year's model made it into an "MKBHD edition," based on his preferred color schemes for his other YouTube videos. The PRODUCT(RED) edition is limited to the iPhone 8 and iPhone 8 Plus this year, with the color option not presently available for the iPhone X. Expressing he "really wants" an iPhone X in red, Brownlee adds that he brought it up with Apple, but "they wouldn't say if they would do it or not." iPhone X owners won't lose out on supporting (PRODUCT)RED completely, as a Leather Folio is being offered, alongside other (PRODUCT)RED items, including Beats Solo3 Wireless On-Ear Headphones, Beats Pill+ Portable Speaker, and other iPhone, iPad, and Apple Watch accessories. The PRODUCT(RED) iPhone 8 and iPhone 8 Plus are available to order online in select countries, and in stores from April 13. Offered in 64GB and 256GB capacities, the (RED) models will start at an Apple retail price of $699. Portions of proceeds for all PRODUCT(RED) purchases go directly to Global Fund HIV/AIDS grants that provide testing, counseling, treatment, and prevention programs, with a focus on eliminating transmission of the virus from mothers to their babies. Since partnering with (RED) in 2006, Apple has donated more than $160 million to the Global Fund, serving as the organization's largest corporate donor. (RED) says Apple's contributions over the last 11 years equates to more than 800 million days of lifesaving ARV medication. It's a shame one has to cover up the beautiful Apple phone designs with a case to prevent them from the slightest damage from daily handling or the occasional drop. My Jet Black iPhone7 has been covered up since day one. I take it out of its case only occasionally to fondle it and polish it, but it still has "micro-scratches" because no case keeps out all of the dust and dirt. The fourth story within a few days about a phone being available in the color red. Slow news week, I suppose. Such a nice looking device! That is a matter of choice. Most use cases, but plenty of people don't. I have an X and use a case half of the time. I had a 7 and used a case only sometimes (going to the gym, etc). I don't worry about silly things like micro abrasions, fingerprints, or scratches I can only see when holding it just so. Life is too important to fret over phone fetishes. Plus Apple took my 7 back as part of the exchange program no problem, scratches and all (a couple of deep scratch/dents at the corners). Anything that has a polished finish is subject to some degradation in 'daily handling'. I'd call that inevitable wear, not damage. Expecting a bare phone not to be damaged from 'the occasional drop' is silly at best. Manufactures design these to look good as well as function (though that metric is subject to manufacturers' sense of style). I've owned 5 iPhones starting with the original iPhone and have never damaged one, ever. I've used a clear shield front and back, and the phones remain pristine. One phone was used as a work phone so a case was needed. The shields kept it pristine in the case as well. Life happens. I've prepared for it. I love my iPhone X, but I felt I had to put a Speck case on it to prevent micro scratches. I actually don’t mind the scratches, but Gazelle will.